The Russian Navy will start a three month-long expedition to islands of the Greater Kuril Ridge in April to study the possibilities of setting up a Pacific Fleet base there, Defense Minister Sergei Shoigu said on Friday. "Pacific Fleet sailors will start a three month-long expedition to islands of the Greater Kuril Ridge in April. Their main goal is to study the possibilities of setting up a Pacific Fleet base there in future," Shoigu said at a meeting of the Defense Ministry’s board. BAL Coastal Missile System of the Russian Navy Pacific Fleet Coastal Troops seen during its first test launch in Primorye territory. The defense minister said earlier that Russia would deploy Bal and Bastion coastal defense missile systems and new-generation Eleron-3 unmanned aerial vehicles (UAVs) on the Kuril Islands in 2016. It is intended for the control of territorial waters and the protection of naval bases and coastal infrastructure. Kh-35UE (also known as AS-X-20 Harpoonsky) Anti-ship missile in its surface launched export variant (launched from BAL-E mobile coastal missile system export variant). Kh-35UE`s (export modification of Kh-35U) warhead has a weight of 145 kg and a maximum speed of Mach 0.85. It is supposed to be a very effective anti-ship weapon, according to several Russian and Western experts. - the 72nd Regiment Bravo of the Pacific Fleet (Smolyaninovo, Primorsky Krai). The 3K55 Bastion coastal missile system is designed to eliminate single surface ships and vessels within assault units, attack groups and convoys at a distance of up to 300 kilometers (186 miles). The system can also hit ground targets. 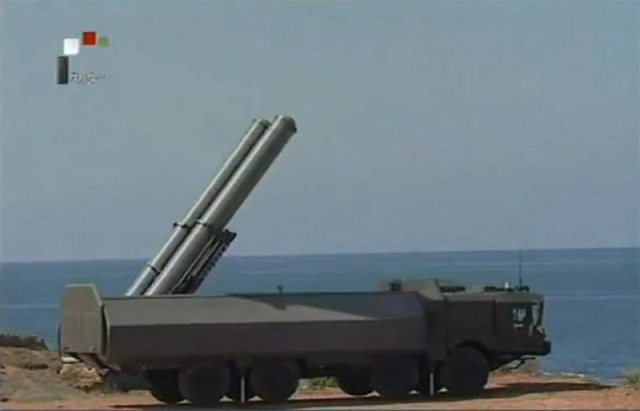 The Bastion coastal missile system is in service with the Russian Armed Forces. The system has been delivered to Syria and Vietnam. The Bastion coastal missile system was deployed on the Crimean coast in 2014. In September 2014, the Bastion coastal missile system was used to destroy a training target at a range of 90 kilometers (56 miles) in the central part of the Black Sea during maneuvers.